1894: After a scoreless first half, Nebraska rolls to a 22-0 win over Grinnell. "It was evident that the Iowa boys were played out" in the second half, the Lincoln Evening Journal reported. 1919: Oklahoma makes a goal-line stand in the third quarter and then scores after a blocked punt in the final period to gain a tie with the Huskers in Omaha, 7-7. «1924: The Huskers win at Kansas, 14-7, thanks to two third-quarter TDs in quick succession -- a 30-yard fumble return by Rob Roy Robertson and a pass play, John Rhodes to Melvin Collins, covering 60-plus yards. 1929: Pitt scores two second-quarter touchdowns, then fends off a Husker rally in the final period for a 12-7 win in Lincoln. 1934: A blocked punt late in the game sets up a 25-yard Husker drive, allowing Nebraska to escape Norman with a 6-0 win over Oklahoma. 1939: In a battle of AP Top 20 teams, No. 16 Nebraska dominates No. 19 Baylor, 20-0, outyarding the Bears 247-61 and limiting the visitors to three first downs. Herm Rohrig twice connected with Ray Prochaska on touchdown passes. 1944: Losing to Kansas for the first time since 1916, the Huskers gain just 49 yards and four first downs in a 20-0 defeat in Lawrence. 1949: A long fumble return sets up Oklahomas first touchdown, and then its all Sooners in a 48-0 drubbing. 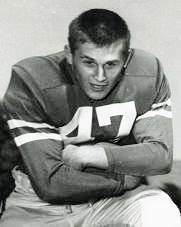 «1954: Two Willie Greenlaw TD runs in the second half lift Nebraska to a 20-6 upset over No. 11 Colorado. 1959: The Husker offense sputters again in a 9-0 loss at Missouri, and the Daily Nebraskan observes that "the outlook is anything but bright" with Oklahoma coming up next. 1964: The Huskers hold Colorado to two first downs and 51 yards in a 21-3 win in Boulder. 1969: Guy Ingles stars (5 catches, 163 yards) and the defense is stellar as NU downs Oklahoma State, 13-3. 1974: QB Dave Humm enjoys a record-setting day as Nebraska dismantles Kansas, 56-0, in Lawrence. 1979: The Huskers register their third consecutive shutout in a 36-0 win at Oklahoma State. Wingback Kenny Brown set a school position record with 111 yards rushing. 1989: Cornerback Bruce Pickens forces a momentum-changing fumble on a blitz, sparking Nebraska to a 48-32 win at Oklahoma State. Gerry Gdowski rushed for 125 yards and passed for 170. 1994: After a slow start, Nebraska rolls to a 42-7 win at Missouri. Brook Berringer threw three touchdown passes, and Lawrence Phillips rushed for 110 yards. 1999: Fumbles nullify the Huskers 429-275 yardage advantage in a 24-20 loss at Texas. 2004: Nebraska takes a 45-21 pounding at Kansas State. 2009: Thwarted by a bewildering spate of turnovers, the Huskers fall at home to Iowa State, 9-7.